A 67-year-old fisherman airlifted to hospital after being pulled from the water off the Aberdeenshire coast has died. A major search was launched outside Macduff harbour after the creel fisherman was reported missing from his vessel Sea Mist at 12:40. 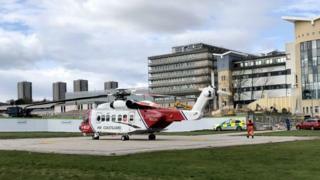 The man was airlifted to hospital in Aberdeen, but died. Det Insp Sam Buchan from Police Scotland said the man's family had been informed and his thoughts were with them. The Coastguard helicopter from Inverness, Macduff and Buckie RNLI lifeboats and the Banff Coastguard Rescue Team took part in the search, alongside local vessels.